JOINT BASE LEWIS-MCCHORD, WASH. - Washington-based cavalrymen gathered at Watkins Field, April 18, to say farewell to their commander and command sergeant major, and welcome a new command team of the 8th Squadron, 1st Cavalry Regiment, 2nd Stryker Brigade Combat Team, 2nd Infantry Division. The day marked the end of Lt. Col Patrick R. Michaelis and Command Sgt. Maj. Daniel Neary's time as the senior command of the Blackhawk formation, and the start of Lt. Col. Brian K. Wortinger and Command Sgt. Maj. Albert T. Washington's tenure as the new leaders of the organization. Michaelis and Neary led the Blackhawks for more than two years. Together, they led the men and women that comprise the organization through rigorous pre-deployment training to prepare them for the unit's deployment to the decisive terrain of Kandahar City in southern Afghanistan. "[The Blackhawks are] forged in the shadow of Mount Rainier, trained on the ranges of Lewis and the brush of Yakima, and the high deserts of southern California; they've been to battle in the very home of the Taliban in the southern province of Kandahar, " said Michaelis. "The troopers that stand before you fought and bled to bring peace and stability to a corner of our world unknown to most, and because of such, became a haven to our enemy." The squadron deployed to southern Afghanistan in the late spring of 2012, about the time the fighting season in Afghanistan traditionally begins. 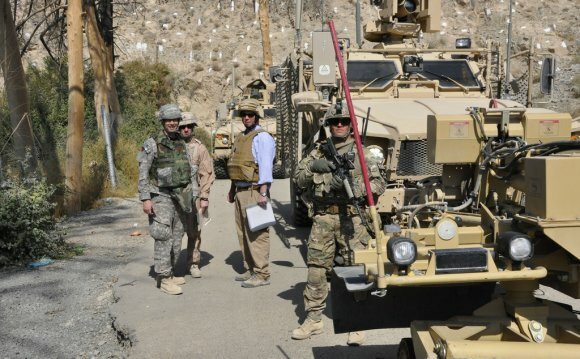 The deployment came at the same time as the US announcement of its goals to end fighting in the country at the end of 2014 by shifting to an advisory role and gradually handing security responsibilities to the Afghans. "You bore the shift away from being the driver of stability in Kandahar to moving Afghans to a position where they became the drivers of stability, and did it successfully, " said Michaelis. "Some now missing from the Blackhawk formation gave their all in defense of an idea." Having to pause several times to regain composure, Michaelis named each of the three Blackhawks that were lost during operations in southern Afghanistan. "Brittany Gordon, Nelson Trent and Mr. Tom Boyle, we should be so fortunate that we have men and women such as these who have given what no one should. We owe them and their families a debt that will never be repaid, and we owe them a place in our history, " said Michaelis. Spc. Brittany Gordon, who served as an intelligence analyst, was the first St. Petersburg, Fla., female to be killed in action. Staff Sgt. Nelson Trent was a member of the 56th Infantry Brigade Combat Team, 36th Infantry Division, from Fort Worth, Texas. His unit fell under the leadership of 8-1 Cav. while in southern Afghanistan. Tom Boyle, who was a retired Chicago police officer, was working with 8-1 Cav. to help train Afghan police officers as they worked toward putting Afghans in the lead of security and stability operations. "Today this ceremony has at its focal point the embodiment of this great unit's history, the squadron colors. As you can see there's dozens, literally dozens, of streamers representing campaigns and combat honors won by previous generations of Blackhawk troopers, " said Col. Barry F. Huggins, commander of the 2nd SBCT, 2nd Inf. Div. Huggins has commanded the Lancer brigade for nearly three years, and participated in two change of command ceremonies for the Blackhawks. "I had the honor to be present the last time we passed these colors from one commander to another more than two years ago. Since that last change of command, these colors were cased, deployed to Afghanistan, and returned with a remarkable record of achievement, and with honor, " said Huggins. "Today I know that these colors, as they pass from hand to hand, are heavier. They include now the history written by the Soldiers on this field; a history written under the leadership of Lieutenant Colonel Pat Michaelis and Command Sergeant Major Dan Neary, " added Huggins. The Blackhawks were officially recognized by Congress on March 2, 1833, and have since fought in several campaigns under different commanders, but always adding to the same legacy. "I've been, both, excited and honored to be part of this storied and colored formation. Rest assured that Command Sergeant Major. Washington and I take seriously our responsibilities to uphold the honorable traditions of the Blackhawks that have been forged since 1833, " said Wortinger. The Northamptonshire Yeomanry was a unit of the British Army, formed in 1794 as volunteer cavalry. It later served in an armoured role before being reduced to squadron level in 1956. It ceased to have a separate existence in 1969.